Ta P a, a 120-meter hill on Tri Ton District in the Mekong Delta province of An Giang, lures tourists due to its magnificent and romantic landscapes. Standing on the peak of Ta Pa Hill in the afternoon, visitors will catch a beautiful scene of immense rice fields at the foot of Co To Mountain or vertical water coconut trees scattered with some human shadows in meditative figures. The setting is perfect when caught in sunset moments with smoke emerging from the mountain and the bell sounds from Ta Pa Pagoda echoing in the tranquil surroundings. Traveling from Tri Ton Town along Nguyen Trai Street for about two kilometers, tourists will reach the 300-year-old Ta Pa Pagoda welcoming you with its two giant statues of the Keynor bird deity. The pagoda is built in Khmer architecture and décor with the main colors of yellow, orange and red. From the pagoda’s tower, visitors are treated to a stunning panoramic view of the busy Tri Ton town below interlacing with the greenness of rice fields and rivers. Moreover, visitors have a chance to admire the talents of artisans via the statue garden with a number of Buddhist characters and genies. The highlight of Ta Pa is a crystal blue lake which is surrounded by weird-shaped rocks. There, travelers will sense they are getting lost in ancient Athens. Facing off Ta Pa Hill is Co To Mountain which is renowned for a fairy yard which sits on top. 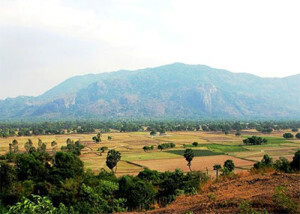 Endowed with such fascinating sceneries, Ta Pa Hill is often chosen as a venue for traditional festivals of the Khmer community and for movie scenes. A temple at the foot of Co To Mountain is where excursionists can take a rest and make camp at night. Heading to the site, tourists should try water coconut which is a specialty of the province.